Affordable housing isn't just an issue in larger cities like Greensboro. Asheville and Buncombe county continue to suffer with stubborn eviction rates. Host Frank Stasio talks with Robin Merrell, managing attorney at Pisgah Legal Services about Buncombe County’s housing crisis. The Asheville-based nonprofit Pisgah Legal Services looked into the numbers and discovered that out of 2,200 evictions filed in 2016, 1,300 evictions were granted leaving about 3,000 people displaced. Many of their clients are single moms juggling work, children, and family while trying to pay rent, childcare and basic living expenses. Through working one-on-one with clients, the nonprofit identified one of the central barriers to tenants keeping a roof over their heads: landlords seeking an eviction can complete the process in 20 days, which leaves little time for tenants to find a new home and secure the needed move-in costs. To curb this problem, they created the Tenant Eviction Response program, which offers on-the-spot assistance for those at eviction court in Buncombe County. Host Frank Stasio talks about the program and Buncombe County’s housing crisis with Robin Merrell, managing attorney at Pisgah Legal Services, which provides free representation to low-income families in need of civil legal services. The highest rent prices in the nation can be found in metropolitan areas like Manhattan or San Francisco. 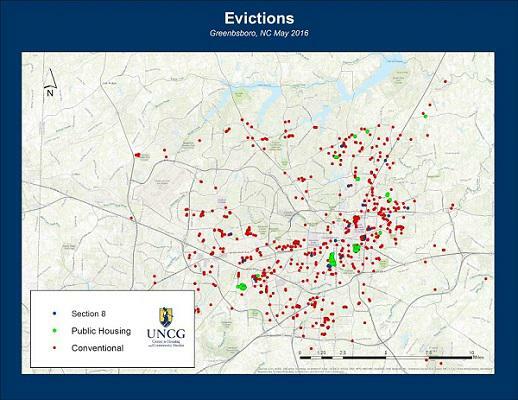 So why is it that Greensboro has some of the highest eviction rates in the country? Greensboro is ranked seventh on the list of the top evicting large cities in the U.S., according to Princeton University’s Eviction Lab.